Hello again Wick, Well after about 7 tries I finally got a working set of electronics using the photocell instead of the timers. Couldn’t have done it without all your instructions and attention to detail on your project. So now I am on to the construction phase and that should go by fairly uneventful. My main concern is what you brought up about the constant battery drain from the photocell. My possible solution to this is to try an Adjustable Repeat Timer Delay Relay. My thinking on this is this: if I splice the line out1 and out2 from the photocell individually to 2 separate delay relays that I can adjust the time to allow energy to flow though the system for 1-2 minutes allowing for the functioning of the actuator but after that time, the delay relay will disconnect the flow of energy until another cycle begins. Which photocell are you using? uxcell® DC 12V Photoelectric Switch Sensor Relay Module 50mmx25mm w 2 Cable (from Amazon). Hi Tom, did your delay timer on the photocell work? I am also interested in finding a way to reduce the constant draw of battery power that comes with using a photocell and thought a delay timer might do the trick? I am interested in building one of these for use when I am out of town. This looks far better than the ready made versions I have seen on Amazon. Where can I get a list of parts and where to buy? Hi John, thank you — I’ve added the parts list to the post. novice here but where does the solar play into new model here? Hi Laura, I wrote more about the “power supply” including 2 options for solar power. I ran across your blog after researching a way to open/close a ceiling vent using a linear actuator. I am searching for a simple way to slide a insulated foam board back and forth to open/close a vent to my whole house fan. My question is would I be able to use a on/off light switch in place of the timers? When the actuator fully extends/retracts does it turn off or continue to drain power? Hi Dave, an ON/OFF switch — single pole single throw (SPST) — wouldn’t work, but a DPDT switch like this ON/ON switch or this ON/OFF/ON switch will work great & you don’t need the relay module. You’d run positive/negative power to the center switch terminals & then run the linear actuator leads in an “X” to the terminals at opposite corners, like this. The 3-position ON/OFF/ON switch I linked to stays in position, so in other words if you switch it ON, you can take your hand away & it stays ON. The linear actuator has built-in limit switches so it cuts power to the actuator motor automatically when the arm is fully extended/retracted (so to answer your question, there’s no power drain). If you’d prefer the switch to automatically return to OFF, you’ll want a momentary DPDT switch. However because of the limit switches you don’t need a momentary switch & in fact it would probably be less convenient since you’d have to push the switch for the ~20-30 seconds it will take for the vent to close. I think the simple ON/ON switch might work best. Good questions — I’ve updated this post with info about wire size & more about the connectors. We are wondering why we need a relay at all with one timer opening in the morning and one timer closing in the evening? Hi Joyce, the only timers I’ve seen available are SPST, meaning they only switch one wire (“single pole”), & only on or off (“single throw”). So with SPST switches, the (-) wire needs to be connected permanently & the timer controls (+). However since for each timer you need +/- connected opposite from each other (to reverse the polarity to the motor), that forms a short circuit when any timer is activated. Hi Lee, sorry for the delay there. Can you hear the relay switching? If it’s working it will make an audible clicking sound & if you put your finger on the relay you will feel it as well. If it’s still not working, can you post a photo? Any reason why two of these couldn’t be used directly, eliminating the relays? Hi Michael, see my reply to Joyce above — with only the SPST timers, there’s no way (I know of) to have just the timers reverse voltage without also short-circuiting. Any way to do this without two timers? Hi, yes you can although I think 2 timers is the better way. That said, you can use one timer or better yet, a photosensor. With 1 timer you’d set up one single event spanning the entire time want the door to stay open, & it uses a DPDT relay. Run power directly to the NO terminals on the relay, & also to the NC terminals but with reversed polarity. Then wire the timer or photocell to the relay coil, & connect the linear actuator to the common. The downside with that setup is the timer relay & DPDT relay both stay energized for the entire time the door is open, so there’s more power consumption (mainly only an issue for solar power, not dedicated power) & more likelihood for the system to fail — the timers are pretty cheaply made & I’m not convinced they would do well staying powered up for ~12 hours each day. Use a diode to prevent that. I built this using the linear actuator in the horizontal position to open and close a standard chicken coop door. Works like a charm. The only problem that I had was that the DPDT module requires the timer to sink the voltage to ground, so it didn’t work (for me) when wired as shown in your diagrams. I simply made the switch connect to ground (common) instead of the 12V shown, and all was well. Can send pics if you wish. Hi Michael, sounds like the difference probably is just that you didn’t notice the relay module as I’ve shown it has both jumpers set to HIGH (outward). HIGH is how my module came shipped, so that’s what I went with. Either setting works, but as you found out, if you have the jumpers set to LOW (inward) then you’d have to modify the wiring. Can you replace timers with Arduino nano? Or pro? Hi Thomas, yes that should work fine — Arduino has libraries available for time & timer functions. However you’d still need to use a relay since the Arduino can only switch 40mA (maximum, 20mA recommended) @ 5VDC. Thought I would chime in after my build experience. Please add a note advising people to check the position of the two jumpers on the relay in the bottom right corner of the unit. The jumpers should be positioned as shown in your image; all the way to the right (don’t have the relay with me to indicate the names of the pins). My unit arrived with the pins on the left and I spent a good hour troubleshooting the circuit, including disassembling and reassembling three times before seeing that tiny detail in the image. Great suggestion. I’ve added a note about that. My relay came shipped with jumpers set to HIGH & I just assumed that was the standard setting, but clearly not! Thanks for catching that. Nicely done, going to attempt this. Got a Paypal account folks can send donations to for your effort? Hi Gabriel, thank you for the donation offer. I’m all set, just happy to hear people find it helpful. Any questions, let me know. Hi James, glad you got it working. Just curious, were the screw blocks the problem with it not working initially, or something else? The screw blocks strip out very easily….I didn’t over tighten…My initial set up was getting in a hurry..My fault…The door works great now and I feel very confident that no predator is getting my girls…Again, great setup.. Awesome and very useful information. I have had your recent version up and running and worked flawlessly for a week or so. The past two mornings however it has stopped a few seconds into the opening. Trying to do manual mode the timer and the relay blink in unison with each other. Temps have recently dropped to frost levels and I am thinking that maybe this is the culprit. I went through the wires making sure all connections were good after the first malfunction and it worked as it should. I was just curious if you or anyone else may have similar issues with frost/cold temps. I am going to try to make an enclosed housing for this. I am in TN so winters are not crazy but we do have freezing temps most mornings. I have dedicated power dropped with a 12c 5a adapter. Just trying to put my finger on the issues with opening as we will be leaving the following weekend and would like to ensure this doesn’t happen when we are gone. I feel bad b/c the chickens can get their heads out but not their fat bodies. If you have the patience you can lower the overall cost by shopping ebay (from china). I have about $75 into it. Thanks again for this tutorial. One of the best things for any chicken owner. Hi Ian, that’s interesting. I live in VT & haven’t had that problem due to frost. I did have a timer fail after 3-4 years & it did something similar then, would blink (very) rapidly. I’ve also seen that happen when the timer doesn’t have sufficient power. But, I’m not sure why that would be happening with dedicated 12VDC power like you have. The timers are cheaply made so that’s my guess — maybe try swapping them & see if the same problem starts happening when the door closes? …that would definitely indicate a bad timer. Hope you figure it out, good luck. I’m unable to my instruction sheet for the uxcell timers. I can’t figure out for the life of me on how to set these timers. Can you tell me how to get these timers working or help me find a set of instructions. Sure. I added timer programming to the instructions, near the end. The problem is these timers only switch 1 wire. So there’s no way I know of to wire opposite polarity (to reverse the motor) without short circuiting, unless you use a DPDT relay (or two SPDT relays) wired as an H-bridge. There’s no situation I can think of where you’d ever need 2 power supplies. NOTE: Both jumpers must be set to HIGH as shown (outward setting). Apparently this relay is occasionally shipped with the jumpers set to LOW (inward), which would require different wiring from what I’ve shown. Yes if your module was shipped with jumpers over the inner/middle pins, pull each jumper block off & push it back down so it’s connecting the middle/outer pins. I just took my plyers and jumped on the side with the 4 pins. From the first to the last I got it to move and then from the second to the last I got it to move the other direction. Maybe that could help you help me troubleshoot the issue. I am looking on YouTube and everyone has the negative or their black wire on the far left side of the timer. I am thinking i could have a timer issue because I cannot even get the light on the timer to come on at all. I hit the manual button and i get nothing at all. But the board has the green light on and i can jump the actuator to work on the board. That does sound like a defective timer. If you push the “manual” button a few times, you should hear a loud click & the red light on the timer will come on. It should work like that as long as you have power connected to the two “power” terminals (left side) — for testing the timer you don’t need anything connected on the two “switch” terminals (right side). Here’s the wiring schematic I used for the CN101A timer which shows positive power to the 1st terminal & ground to the 2nd terminal (going left to right with the timer facing you), which is what worked for me. Like you mentioned, some other commenters have mentioned they reversed the power leads & that worked. Could be different factories manufacturing the same timer different ways? I don’t know. Hi Damien, a number of people have written back just in the last few months to say they only were able to get these CN101A timers to work if (looking at the timer from the front) they connected ground (black) to the far left power terminal, & positive (red) to the 2nd power terminal. Previously I had the power to each timer wired the other way, which is how the CN101A timers I purchased in 2015 & earlier years worked. I’ve updated the wiring diagram to reflect this apparent manufacturing change. Hope that helps. Keep in mind these timers have a rechargeable battery so the clock will continue to function regardless of how you have 12V power hooked up. The real test is if the internal relay will actually switch (audible “click” and the red light comes on) when the timer event occurs or if you push the “manual” button. The button cycles through ON -> AUTO -> OFF -> AUTO so you’ll need to push it until the display reads “ON” to manually trigger the timer. Remember to set it back to AUTO when done. Great tutorial. I’m working on getting it all set up now as well as adding a light on a timer too. One thing I found different was your timer wiring. Your negative and positive power terminals on the timer seemed to be the opposite of the model I got. It has PINs on the one end which I have no idea how to connect wires to. In terms of that blue relay you mentioned, that should work fine. It doesn’t have the selectable high/low level trigger that the other relay has, but according to the specs on Amazon, that relay is hard-wired for high-level trigger & that’s what you need. It doesn’t have the easy screw terminal block but to connect wires to the pins, get breadboard jumper wires that have at least one female pin connector. The wires typically come as a connected strip but they just tear off easily from each other … think Twizzlers. So you’d use female plug ends to connect to the pins on that relay (VCC/GRD/IN1/IN2) & strip the other end for use with a spade connector or whatever you’re connecting to. Most electronics/hobby stores should have breadboard jumper wires. Just make sure you get female/plug ends (not all male/pin ends). That 2nd relay you found is the identical model to the one I linked to in the post, just a different brand name (uxcell rather than SMAKN). But I don’t think there’s any reason why that blue uxcell relay you ordered won’t work just fine once you get pin connectors. Or with a soldering iron you can always solder bare wire ends directly to the pins. It’s a little tricky but works fine, I’ve done that too. Any other questions, fire away. I’ll follow up when it’s all done. Are there any concerns about the force the actuator can apply? 225 pounds is a lot of force if it gets applied to a chicken! Or does the noise keep the chickens away from the door while it’s in operation? Hi Aaron, good question. Like you mentioned, the noise does the trick. Also the door closes VERY slowly. Ours travels ~18″ over 30 seconds which is plenty of time for any chickens to move out of the way. You could also put on a rubber or wire “bumper” to move chickens out of the way as the door closes if you end up having some obstinate chickens that prefer to stand in the doorway. Typically our chickens are happily roosting inside the coop by the time the door shuts & are nowhere near the door. It’s good to make sure the door shuts after it gets dark & not any earlier while the chickens are still active. In 5 years so far of using the automatic coop door we did have 1 chicken die early on. It was a small silkie that the other full-size chickens liked to pick on, so the silkie would roost in the coop doorway until the last minute as the door shut. We lost far more chickens to NOT having the automatic door, so even with the one fatality it’s been worth it. I just finished setting up the solar panel and battery version. The links to the parts were all active, except the timers came direct from China and took longer than expected. Easy to set up and install, the wiring diagram worked perfectly. I used 14 gage wire except for the solar panel and battery wires since I had about 15 feet of wire. I can’t believe it, my chicken coop closing days are over! Thanks for such a great tutorial. Everything is wired and I have a green light on the relay board, and the antennae works when hard wired, however, I get nothing from the timers when programmed according to the manufacturers instructions. I don’t even get a red light on the timers when I push the MANUAL button. I tried with the polarity reversed also, nothing. Bad timers? Hmm sounds like it. You may have to push the MANUAL button up to 3 times to cycle through the modes to the point where it turns ON (red light & you’ll hear an audible click). The cycle is AUTO -> OFF -> AUTO -> ON. Try wiring your power source straight to each timer individually with nothing connected to the switched terminals. If that doesn’t work & you’re using a 12V power source that works (maybe try a different power source? ), sounds like the timers are defective. Just out of curiosity before trying out this setup, what would happen if one sets timers to actuate at the same time (or some fault leads to them both triggering at the same time)? Any difference in the 2ch optocoupler relay version and the dual spdt version in that regard? Im guessing the optocoupler has some sort of failsafe inbuilt? My brain struggles to calculate what (if any) effects this would. Im not using the linear actuator motor by the way, but a smaller 12vdc brushed reversible motor. If both timers activated simultaneously: see the “Circuit Details” section of my post which goes over this scenario. Short answer — it’s safe, not a short circuit. Optocoupler vs relay: Optocouplers are designed for situations where there can’t be any interference passed between the switched circuit & the coil circuit, especially where there’s a large voltage difference. For this chicken coop application where everything is 12V & nothing is electrically sensitive, optocouplers have have no benefits (that I’m aware of). Just as a caution to anyone trying this out: I have purchased three batches of the Cn101A specifically in “12VDC version” (i suspect there are actual differences on the circuit board between 12vdc and 220vac, but they are all called “Cn101A”) _and_ one batch called “L701” (same timer but rated for lower temperature (-20) and with a curvy arrangement of buttons) the last month or so (april – may 2017), and they are all clearly market for wiring Positive IN on the first terminal that is shown as Negative here. Since I assumed the stamped on wiring diagram was wrong (and this page correct), I wired this all up, and blew a small something connected right after the Relay inside the Tmer itself. No sound, no smell, only indication something was wrong was the timer lit up its indicator light when set to “auto” _and_ when set to “off” even though there was no “auto” (programming) set for the timer. No current passed through the Timer (no DC out) on the far right pole either in ON or in AUTO even though light came on. Funny thing is, when this little whatever blows, it creates a short, that obviously affects (and shorts) any other timers added after removing one faulty within this diagram. I am sure this wasnt of much use to anyone, but short story is: I have blown a little reddish-brown cap, diode or whatever thet are called on four brand new timers trying to power them as shown in the diagram on this page. All bought 2017. Three branded Cn101A 12VDC, and one branded L701 12VDC. The little thing that blows looks like an ant, and when measuring Ohms across blown ones, they act as wires (Ohms measures equally on both sides), where non-blown only can be “Ohms-measured” one way. And just to be clear: I have no idea what I am talking about. I could be completely wrong on all this, but four timers blown warrant me at least warning if it turns out polarity is “changed back” or is randomly switched by manufacturer still. -Oh and Yes, All is working fine if I set Timers up with first pole as Positive (DC 12V in) and change any and all wiring from there accordingly. One thing also worthy of mention is some of my Cn101A comes with a “autolocking” feature. They go into “locking mode” if no tuching of buttons for some 5-10 seconds. To “unlock” (for when you want to press “manual” to engage a Timer), you have to press the “C/R”-button four times. Thanks for the info! I have everything set up but no power to the linear actuator. Red light on the timers when I turn them on, I don’t hear anything coming from the relay. Have the exact power source you mentioned 6amp. timers are the same. Could it be they are bad? Actuator work straight from power source. Are the jumpers on the relay module set to high-level trigger? When they are wired correctly, the relays on the module will make an easily audible click when activated, just like the timers do. To test the relay module, run (+) straight to the IN1 or IN2 terminal to trigger the relay manually. If you send a closeup photo of the wiring, I can try to troubleshoot it that way. I come back to the question related to the relay, i review you answer but can we replace it with two diode simply? Wathever input voltage on Timer out should be Ok if the 2 timers output are not on at the same time? This looks like something that can be used on a fly door….which is nothing more than a swing door like a screen door allowing the chickens to have a fly and then a door letting them out to free range. Can the actuator be used horizontally? Sure, the actuator will have no problems mounted horizontally. The 12 V 6 AMP power adaptor is for a laptop. I need to cut the end to the laptop, and strip out two wires, right? Is there AC to DC converter to which I can use wire connector? You can strip the wires, or you can find a corresponding female 5.5mm x 2.5mm 12V plug end like this one or one with wires if you prefer. I had mine working then a red light on the relay came on. It’s labeled LED2. Any idea what that means? The green power light is also still on. Thanks for the help. Hi Brian, I believe that means it’s being triggered. Is the timer connected to IN2 activated? (red light on in the top left, next to the “MANUAL” button). Hey Wick, So i’ve wired everything up and cannot get the relay module to switch. The timers make the click when programmed or turned on manually. The module is set to high level trigger. I’m using a mortycycle 12 V battery to power the system. Are there lights on the relay module when it switch’s? Hi Chad, I’d try triggering the relay module manually rather than using the timers — keep all the wiring the same (even the timers can stay connected), but jump positive power straight to the IN1/IN2 terminals (one at a time). Some people have complained that the timers they are getting are defective. If you have a multimeter, measure continuity (or resistance works too) on each timer’s switched terminals when the timer is activated & see if it’s really switching. From what you wrote though, sounds like nothing is working & that would be rare for both timers to be bad. It could be a bad relay module but again for both relays not to work, that would be pretty odd. The timers do take a certain amperage level for the internal relay to work but it’s pretty low — your 12V motorcycle battery should be plenty, so I don’t think that’s the problem. Maybe send a photo or video of your setup? Thank you so much for these directions. All the details you included made it easy to build and troubleshoot. Thanks for taking the time to be so thorough and include all the links to supplies. My new automatic door is working great! The chickens aren’t so sure yet but I think they will learn to appreciate it. Hi, this is a question pertaining to the D.C. Timer a.k.a cn101a. I have used this timer in the past to successfully run a water pump while out of town. This year, however, I have set up the same timer to the pump (never changed the wiring, still the same), programmed the timer, checked that is will work, then left it in the AUTO mode. Upon returning back to town, the timer somehow had switched itself to the Off position!!! The first time this happened I assumed user error on me for not leaving it in AUTO mode. Then it happened again! I switched the cn101a timer with another I have successfully used in the past, and BAM, same thing! The timer is somehow switching itself from AUTO to Off mode! I am totally baffled. Maybe the wiring is wrong somehow, but it was never changed from previous years. Any insight to this problem and these timers would be greatly appreciated! Has anyone else noticed this anomaly, or had this happen repeatedly? Thanks. Hi John, I’ve never had the mode on those timers change on its own. Excessive moisture maybe? I know this is an older comment, but I’m having issues with this. But I’m so thankful for your tutorial on this . It’s going to be awesome! Once I start hitting the manual, I would have issues getting it back to auto. 2. I have this mounted on the inside wall and used a flashlight to set the timer . So when I flash a light on the timer, the flash light reflected “Auto”, so I thought it was in “Auto” mode. So I pushed the reset button and made sure I set it without a flashlight too bright on the screen. I know these are elementary issues, but I’ve never done anything like this. I’ve never wired anything in my life. Hi Christina, good suggestions & nice job! The manual/auto mode indicator on the timers can definitely be hard to see sometimes depending on light & the angle. i have tried to build this electronic system (the two clocks and the relay) with your plans but it doesn´t work. I wired it like in your plan, but i have no elektricity at the com1 and com2 places . I think i should have there +12V or -12v . At the relay there are three lights flashing. The relay module shouldn’t have any flashing lights. Did you purchase the same module I linked to in the post? Without knowing more, sounds like a problem with the power supply, the wiring to the relay module, or the relay module jumper settings. I’d go back & double check everything. Keep in mind the relay module needs it’s own dedicated, unswitched power source as shown in my wiring diagram. I’m guessing you have the relay module power source mistakenly connected to the switched power from a timer. That’s the only thing I can think of that could make the relay module LEDs blink. i have bought a new relay and now it works. Maybe the relay was damaged by myself by a short circuit. Thanks for the great detailed write up and additional troubleshooting. The links are all still live and well and obviously very useful. I got mine set up today and looking forward to years of happy hands free door openings and closings. Couldn’t have done it without some kind of help like you provided. I will share with anyone who will listen. Thanks! Also, you mention in the instructions when using a solar array that it will slowly drain the battery at night… this shouldn’t happen if you have installed a diode in between the array and the battery, allowing the electricity to pass only in one direction. Hi John, I didn’t mention the diode because the charge controller option (the next paragraph) is typically the better inexpensive solution for managing a battery, and includes a blocking diode. But of course you are correct that a blocking diode does solve the discharge problem. I ordered all the parts for the photocell setup but I cant get the photocell to reverse polarity on the linear actuator. I bought a photocell that has 3 leads, red/white/black. Any suggestions? Hi Mike, which photocell setup would that be? I didn’t go over how to do it with photocells, so without more details I don’t know how you’ve set it up so far. Will hooking the battery up backwards (positive on negative and negative on positive) burn out the relay? I accidentally did that with out a fuse and now the relay turns on, but does not work. It’s has a constant green and red light all the time when hooked to the battery. Brandon, just a guess but yes I bet something blew. Polarity doesn’t matter with the relay coils but I bet there’s other components on the module where polarity probably matters. Luckily $9 will get you another relay module & another shot at it. Hi, Thanks for this carefully detailed explanation. However my attempt is not working. I followed the wiring diagram at the top. Then I looked at the bottom and saw that the testing diagram was wired differently. Why is that? YET ANOTHER NOTE: Sometime in 2016, apparently whoever manufacturers these CN101A digital timers made a change so the polarity for the two power leads to each timer needs to be reversed from how my timers from 2015 & earlier work. I’ve updated the schematic diagram to reflect this change — so now ground is connected at the far left of each timer. That’s the only wiring difference I’m aware of. Let me know more about how your setup isn’t working & I can try to help further! What happens when you switch the timers to “manual” (does the red light come on the timer, & do you hear a click? ), & are there any lights illuminated on the relay module? Thank you for your response. My wiring is as at the top of the page. Yes, there is one green light on the relay module (SMAKN0). When I changed the timers to manual they did not click. Hi Carol, near the end of the instructions I’ve posted two new videos that may help troubleshoot relay & wiring problems. Although since your timers aren’t clicking, I think in your case the timers are the problem. You might try swapping the power leads to the timers. You’ll see in my two troubleshooting videos that the timers I received from Amazon 2? 3? years ago need (+) wired to the far left terminal & (-) goes to the 2nd left terminal (looking at the timer from the front, as in the videos). A number of people recently reported that the timers they received in 2017 needed (-) to the far left terminal & (+) to the 2nd terminal, so earlier this year I changed my wiring diagram, but you may have some of the older timers that need power wired the same way I have mine? I don’t know. Also the red lights did not come on. The box my timers came in had a place to check CN101A or CN102A. Neither box was checked. Wonder if anyone can help. I’ve got everything all wired up and get the same result twice – with two different relays. So I’m assuming I’m doing something wrong. Whichever timer I connect to IN1 fails. The Red light comes on, I hear a click and then it turns off. IN2 does what it’s supposed to, it just turns on. I sent back the first SMAKN relay module and got another. Got the same result. It seems like it’s shorting or something when it happens. Initially if I disconnected to the timers and then reconnect I could test manual again. But this last time, now both timers seem dead. Any ideas on what I could be doing wrong? Hi Tshann, assuming you have a reliable 12V power source, sounds to me like defective timers. You can always try the timers without them connected to the relay module. They should turn on (red light) for the entire period you program them to run. Not sure what else to suggest. Built the door, worked like a charm for 3 days then nothing 🙁 looks like the voltage reads 11.5. on the solar controller. I read that it needs to be at least 12 volts to program it (I didn’t do this before oops). When I do manage to get it to 12 volts should I program it to shut off at a lower voltage? What voltage is the lowest I can get away with? Or can I get a larger voltage battery? If so what kind? As a novice to this, I’d appreciate the help. Hi Theresa, the default settings of any solar controller I’ve ever used should do the trick. Any 12V solar panel in proper sunlight will put out more than 12 volts which then charges the battery. My guess is the solar panel is either defective or not in enough direct sunlight each day. There could also be something draining the battery faster than the solar setup can charge it, but assuming you’ve built this setup, the timers are the only constant (very low) power draw & the 10W solar panel I mention in the specs will easily keep up with that. A higher-amp (not volt) 12V battery still needs more than 12V volts being output from the solar panel/controller to be able to charge the battery… using a larger capacity battery would just extend time until the same problem happens. Good luck! Good to know! I live in cloudy Portland, OR, so perhaps I’ll try a bigger solar panel and/or moving it. The panel is charging, but there’s too much drain on the battery for the light I’m getting. I appreciate all the work you did on this but you real only need the 8 pin DPDT relay and 1 (yes ONE) timer. The relay itself is the key. Then put criss cross jumpers across PINs 3 to 5 and 4 to 6. Put lead to motor to PINs 4 and 5, make sure the polarity is wired so the door is to the down position. (night time position). Wire the NEG from battery to PIN 2. The POS battery goes to the timer on/off terminals. Then to PIN 7. And you are done, that’s if you use the an actuator like you did here. If you use a motor of a different sort that does not have internal limit switches the you simply add them. The way it works is that when down and timer switch is off there will be power going to the actuator in the down/closed direction, and the limit switch disconnects the power. And there it will stay all night until the timer turns the switch on. The switch goes on and the relay activates. door goes up/open and it stays there until the timer turns the switch off. A photo cell can replace the timer or be added as a bypass (add switch for testing) or as the main switching source. Timer will run but if timer fails the photocell will open the door, and visa versa. Lot cheaper and less complicated. I hope this helps. Hi George, thanks for the comments. That method has its pros & cons. I think the main issue there is your way energizes the DPDT relay coil for the entire time the door is open (or closed, depending on what cycle you wire the relay to reverse polarity for). Energizing the relay for 12 hours each day causes the relay to heat up & wear out — the limit switches only cut power to the actuator, not the relay. Your way is also a much higher power drain since the relay coil is on for hours at a time. That would be fine of course with a constant power supply but not with a solar panel/battery setup. With the two-timer method, the relay coils are only energized for a minute during the actual door opening/closing — so the two-timer method is far more efficient for power consumption and the relays will last much longer. Also I don’t agree that your method would be a “lot cheaper”. One less timer is $5 savings & the single DPDT relay vs the double is maybe a few dollars difference. You might save $10 total. Definitely more than one way to accomplish a coop door opening. Just be aware of the pros/cons of each method & choose what works best for the situation. Thanks again for writing. 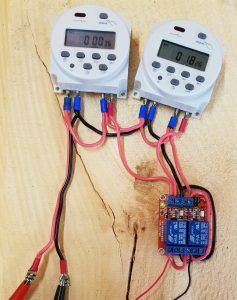 When using a charge controller, are the timers down the line, after the charge controller? If you’re using a charge controller, everything connects through that. There are 3 sets of terminals on the controller: panel, battery, load. You’d connect the timers/relay to the “load” terminals. So yes, with that setup I’d say the timers are “down the line” from the charge controller. Thank you for you help, I’m sorry to bother you, I hooked everything up and nothing worked, then realized the Pos & Neg on the timers where reversed from your diagram. The actuator closes on Manual but I cannot get it to open. What might be the cause for that? What is wrong? Do both timers need to be in Manual? I have tried every combo to no avail. Also, can you walk me thru the timer settings please? The “OPEN” timer is set to on 7:30 then off 7:32? The “CLOSE” timer set to on 17:30 then off 17:32? So many wires, so confusing. Hi Chris. To force the door to open you’d want to set the “open timer” to manual (red light on), & the “close timer” should not be triggered (red light off) — in other words set it to AUTO mode & not during a programmed event. If that doesn’t work, either the open timer is bad, or the wiring might not be correct. To test the relay module, unplug the timers from IN1/IN2 & skipping the timers completely, jump positive power to IN1, then to IN2 (separately). Power to IN1 should trigger open; power to IN2 should trigger close. To test the timers, try swapping the timer wires where they plug into IN1/IN2, so the open timer becomes the close timer & vice versa. Then try activating manual mode on the timers (one at a time). If the door opens but not closes, the problem is a defective timer. There’s a small chance the problem could be the actuator or built-in limit switches but I think that’s pretty unlikely. 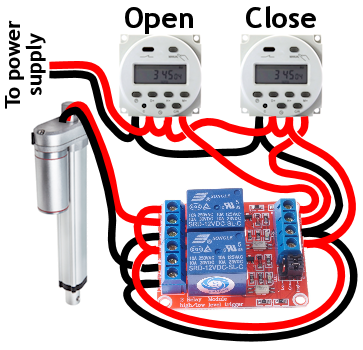 Would using a International ST01 timer change the wiring diagram any? I want to try and use one of those because they have a feature that auto adjusts dusk and dawn times throughout the year. Seems that it would help eliminate necessary adjustments. Thoughts? That’s really cool!! I’m assuming you mean the Intermatic ST01. Looks like that will work except for possibly the operating temperature range, which is listed as “32°F to 104°F (0°C to 40°C)”. And the timer settings please? Yes, that’s correct. Unless your actuator run time takes longer than 1 minute, 7:31 & 17:31 should work for the off times, but the 2-minute times you have will work fine too. Both timers seem to be working, they light up, they click, etc. But, auto on one and on for the other would do nothing. The relay has a green light and a red light on, but: “unplug the timers from IN1/IN2 & skipping the timers completely, jump positive power to IN1, then to IN2 (separately). Power to IN1 should trigger open; power to IN2 should trigger close. ” DID NOT do anything. I know the actuator works b/c direct to power opens it. This wiring setup closes it only. I took it all apart, off the coup, brought everything up on a bench, re-wired everything from scratch, got some better wire connectors, but it will not work. As I mention in the instructions, make sure the relay module’s jumper block is set for high-level trigger (jump “Com” & “High” for both S1 & S2). If that’s not the issue, then I think the relay module is either wired wrong or defective. Let me know, interested to know if you figure out the problem. It’s on high, wired like your pic at the top of this page. If a high-level trigger isn’t triggering the relay module correctly, that’s the problem. One other thing to consider before replacing the relay module is make sure whatever power supply you are using is within spec for the relay module. Thanks for you help Wick, I have the same battery as you linked on this page. I will order another mod. With two lights on the mod, it’s hard to see it as defective…. I made two videos for you – a walkthrough of how the timers/relay should function, & how to test the relay module. I didn’t do a video about testing the timers since electrically they are just a simple switch, but let me know if you need help there. Vids are great, thank you. Will report back. My volt meter died recently, but the actuator works, it’s the same thing. When I put the act. to power it opens, when I hook it back to the mod. it closes. My mod. always has a red light on, it does not look to be the case with yours? It will only go out when I disconnect the DC+ wire. Which tells me the mod might be bad? I have a new one coming in a few days. I hope that does it. Mike were you able to make the Photocell work? I am starting down that path as well. I haven’t because I don’t like the constant power drain of the photocell, & I’m also concerned the photocell wouldn’t be reliable in my location with snow/dirt kicked up by the high winds here. But if you want to give it a shot, the photocell makes the wiring simpler. I’d go back to the “DPDT relay wired as an H-bridge” system as shown in my first automatic coop door design — see the wiring diagram near the end of the write up. In terms of the wiring changes for the photocell, you’d get rid of the “power timer” entirely & instead run that (+) lead straight through to the relay. Then in place of the “reversing timer” you’d put the photocell, so the photocell output controls the DPDT relay coil (reversing the polarity) & the limit switches on the linear actuator do the rest. If it operates opposite from what you want, switch the actuator leads. Hope that helps! I received my new relay module and it works. Happiness and joy. Thanks for the awesome tutorial! I’m a total noob, so please forgive my ignorance. I am wondering how to connect the ac power adaptor to the relay circuit. Do I just cut off the barrel plug to expose the positive and negative wires? If you want to get fancy you can always buy a 2.5×5.5mm barrel jack that the 12V end from the power supply would plug into, like this one — you’d cut the plug end off (this extension, not the power supply) & just use the jack end with the wires running to the timers/relays. Hi Wick, I’ve been following this blog for quite some time. What you do here is awesome! How would we do it without people like You!!! Anyways, a few comments above from “Mike” asked about a photo cell and I would like to change from timers to that option. He had asked how to wire it up. Is that something you will be showing us, or should I hold off? I really don’t want to buy the supplies and have no idea how to book them up…..ha! Thank you for the simplest, most cost effective set up I’ve yet seen, not to mention showing how to hook everything up! While I’ve got my orders in for the relay and timers, rather than a linear actuator, I’m planning on using a DC motor I salvaged from a cordless drill. I’m assuming the setup will work (power the device) essentially the same. I have dedicated power to my coop so I will be going that route, but my question is, I have several “wall warts” to choose from to power the motor and the one I found that turned the motor at a safe speed for opening and closing the hatch was a 9v 350ma one. Do you think that would cause any issues? Thanks again! Hi Rich, thanks! Assuming the motor is from a 9V drill then the 9V power supply is right, & the amps you supply to it just need to be adequate to keep the motor turning well. The drill motor draws a lot more power than 350ma under load but as long as your coop door is a very light load on the motor, that setup should fine. Hi there from South Australia. Thanks very much for the guide Wick. I was not able to purchase the dual relay board in Australia so I used 2 x SPDT relays (Horn relays) instead. Worked a treat. I have some pics of my setup if you are interested. Thanks very much for the guide, it was inspirational. Once I got my head around the fact that: when the relays are “at rest”, positive current is flowing to both terminals of my actuator vie the COM of the relay. When a timer turns on the negative is supplied to the COM instead and thus completes the circuit and powering the actuator. Looks great! Nice work using the 2 relays. One other nice thing about this setup is that in the unlikely event both relays are triggered at once, they’ll just supply negative to both COM outputs & that’s also a “rest” state. Thanks for writing, have a good one! I really appreciate the work you did on this post. I had purchased a photo cell activated chicken door on ebay three years ago. It stopped working and the seller did not offer technical help. I ran across this post, ordered the parts, wired the parts and almost soiled myself when it worked! And it works well with almost no current drain when idle. Thank You! Wick, thanks very much for the post. I’ve assembled this set up, but actuator isn’t moving. Timers clicking, green light on relay, but the red lights on relay don’t burn. Tested the relay as your video suggests: red lights are extremely faint and fleeting. Any suggestions? What’s the power supply you are using? Thanks for your response. I’m using a 12 V battery. Once difference b/w my setup and yours. I’m using 22 awg, which is the size on my actuator. Could that be making a difference? And I assume the connections at the relay are stripped wire into screw terminal. Or are you using some kind of connector there? Update: I rewired with 18 awg and replaced the relay. It’s working now. Thanks again for posting this design. very helpful! Yep the connections at the relay module are stripped wire. I twisted & soldered the wire ends before clamping them in the screw terminals, but that’s not really necessary. The only “fancy” connectors I used were quick connect spade connectors that push onto the timer terminals. Most hardware stores carry them in the small parts drawers, or you can get them on Amazon, Digi-Key etc. Thank you! Works great. Used an old lawn mower battery, put electronics in old fuse box after removing innards. Linear actuator is too long though. I wanted the pivoting door to open to about 60-70 degrees from vertical so snow and rain would shed off, and the door also blocking direct wind into the chicken house. 17 inch hinged door. Anyone have a link to the math for actuator placement? Completed my automatic door with these instructions. It works WONDERFUL!!!! The only confusion I had was how to set the timers but I figured it out. For the open timer, set ON to like 0730 and off to 0731. For the close timer, set ON like 1545 and OFF to like 1546. Had to use a smaller guage wire for the DPDT module. Was hard to daisy chain the wires in those small holes lol. Thanks for the instructions, it was a GREAT reference for me. 1) I am seeing battery drain over the course of a week that makes the battery drop down to around 8-9v. Once my system reaches that level of charge, the door will not operate. I’ve change the batter twice (once to a lawn and garden 12v that was fully charged and dropped to less than 11v in 4 days., the other another of the 12v batteries that I got from Amazon – the first would not recharge on a Snap-On charger after it dropped to 8-9v). How do I make my batter stay charged with this system? Would a larger solar charger be the key? I am seeing one green light on the circuit board when the system is not active, and alternating solid red lights when each of the close and open functions are active. 2) I am having a devil of a time getting the system to operate consistently, though this could be a function of the battery issue above. In short, I set the opening time at 7:00am to 7:01am and the close operation to 19:30pm to 19:31pm. I make certain that my timers are set back to AUTO with no red light illuminated on the timers. Yet, when I come back to the coop to check operation, usually in the morning. the Close timer red light is on, thus cancelling the Open operation that follows in the morning. Can you provide any insight into what I might be doing wrong? My wiring is EXACTLY like yours with the exception that the + and – terminals on the digital timers are the older type per the wiring diagram that came with them. Sounds to me like the the close timer is getting stuck ON — the red light should only be on for 1 minute & not for more time than what you set it for. Each timer should only have 1 program event (a start time & an end time, set for MO TU WE TH FR SA SUN). The way you describe having set it up per my instructions, the red light on the timer should definitely switch OFF at 19:31. The timer getting stuck on all night would drain the battery, since in that case both the timer relay & the relay module stay energized that whole time & that’s not how it should operate. I’d try double checking the programmed timer settings & make sure you didn’t inadvertently start a 2nd program event. Or try pushing the reset button & start over for that timer. It’s possible you have a defective timer — those timers are pretty cheap. You could try flip-flopping your open timer with your close timer & see if the same problem starts happening when the door opens. I’ve never had low battery/voltage problems make the timers not able to switch off. The only low battery issues I’ve seen happen when the timers switch on. The red light comes on (weakly) during the programmed event but the timer doesn’t have enough power to actually switch the circuit on, but it still turns off the red light at the intended time. So I don’t think that’s it. Sounds to me like what’s happening with your setup is a defective timer or a programming problem with the timer events. As long as your solar panel is in decent sunlight, you could try adding a solar charge controller (or a blocking diode) if you aren’t using either already, but honestly I don’t think that’s the problem here. The type of battery drain you described sounds like a constant drain & that’s not how the system should be operating. Even without charging, this system can operate on a fresh lawn/garden battery for at least a month. Hope that helps, let me know if you find out what’s going on! Thank you for the quick reply Wick! I’m using the very charge controller you linked to, and oddly, the “load” light stays on around the clock, while the “charge” light is on only during the day (have plenty of sun on the solar panel too).. So, I wait until the morning event, and I’m back to no OPEN event as the CLOSE timer light is now lit again. Somewhere during the night, the CLOSE time is getting charged. I’m going to swap the timers and see if the issue flip-flops to the OPEN timer and report back. Please let me know your thoughts on the charge controller reporting and on “LOAD” light around the clock. Thank you! Hi Sam, the timers do have a constant (extremely low) power draw so that’s triggering the LOAD indicator. I don’t think that’s the problem, but you could attach the timers/relay module directly to the battery rather than the LOAD terminals. With nothing attached to the LOAD terminals, the LOAD indicator should definitely go off. I still think the problem is that timer getting activated mysteriously during the night. The relay on all night would explain why the battery is drained & the solar panel can’t keep up. I vote defective timer. Any luck figuring out what’s going on in the meantime? Hi, i have found complex relay module FRM02 (for example https://www.banggood.com/FRM02-DC-5V-12V-24V-2-Channel-Multifunction-Relay-Module-Cycle-Delay-Timing-Self-Locking-Relay-p-1195229.html?rmmds=search&cur_warehouse=CN ) with additional functions for usage including timer, it seems that it can replace your scheme with 2 timers + relay module. Please check. The FRM02 timer module allows for 2 times (T1 & T2) to be programmed for each channel. For instance with timer function #16, T1 becomes how long the relay is activated (1 minute) & T2 becomes the delay (23 hours 59 minutes) until the next cycle. So the trick is telling the relay when to start looping, & the way you do that is trigger the CH1 (door open) & CH2 (door close) interfaces at the time when you want each loop to start. I think this module would work, but just not nearly as convenient as the CN101A digital timers which you can program all at once, at any time. Hi, Wick, have you already got the module and tested it? Thanks for your attention at my post, I’ve also ordered the module and will test it by my own. Please inform about your experience with this module, because I’m not too experiencedin eclectronics and may do something wrong. I’ve also founded some interesting SONOFF modules to be operated by WiFi and by mobile devices through internet application. I changed my setup, but not before first switching the timers. Oddly enough, the timers now flip-flopped as to which was triggering in the middle of the night. So, the timers are not the issue, and that led me to believe the SPDT relay was malfunctioning. However, I left it in the system, knowing that I had a battery drain. First, to address the battery drain, I took the solar charger out of the mix and used the Black & Decker trickle charger connected to 110V AC power (I have power in my coop), and connected that directly to the battery with leads to the timers still running through the solar charge controller (I still wanted to see battery voltage any time I checked the system). This has cured my problems for now. Second, I have read reviews on that solar charge controller, and none were super positive. One post even stated that it was not adequate for much more than trickle charging something as small as a watch battery. I concur. The voltage fluctuations seemed to cause my switches to operate erratically. In closing, using your “AC option with battery backup” (but with me leaving the solar charge controller inline for battery readings), I now have a system that has been operating reliably for nearly 10 days. I do appreciate all your help and insight into this issue! I love your design, but I have one concern. I worry about the door closing when there’s still a hen outside. I’d like to setup a raspberryPi + webcam so I can view my coop remotely, and then close and open the door remotely as well. Any ideas on how to wire up that relay board directly to a raspberry pi’s GPIO pins? Thank you! Hi Hooked this system up last fall and it worked great. Then it stopped working after 4 months. The actuator was stuck in the close position. Tried to manually operate and the timer light doesn’t come on and the relay board doesn’t click. We replaced relay and the timer and still having the same issue with just the one timer. We also checked the relay and made sure it was set to high. The timer for closing the door clicks and lights fine but the other one doesn’t click or light at all. Could this be another timer that’s bad and could the first one have kicked the bucket after a few months of use? Yes I bet that’s what happened. I had a timer go bad after ~2 years. Ordered another & it’s worked fine for the last 5 years. If you don’t mind spending more money you could try a 12V timer rated for more amps, like this one or this one. Hi Wick, really cool info. I bought a photocell similar to the others posted by Tom and Mike, as well as a timer. I was wondering if this setup could be wired such that the photocell always controls the door opening task in the morning, and the door closing task could be controlled by the photocell OR the timer. The thought is up here in Washington, daylight lasts till 10pm in June/July, but the hens are always roosted before then and the nocturnal creatures are already out by then, leaving the flock vulnerable. I’m trying to be extra lazy and not adjust the timers throughout the year, so the photocell would do most of the work during the year, and in the summer months, the timer would be set to a fixed time prior to sunset, say around 8pm. Any idea on what the wiring diagram for that would look like or if it’s even possible? Sure, I’d go back & use the “DPDT relay wired as an H-bridge” method. 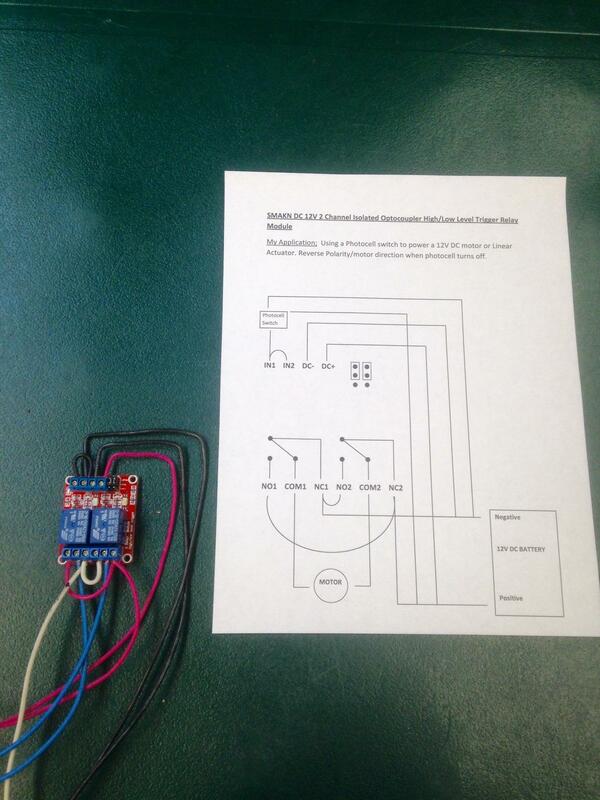 See the wiring diagram towards the end of the writeup. 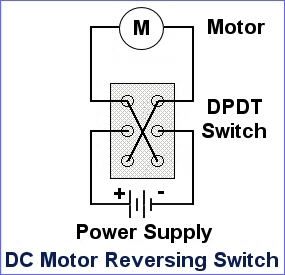 But replace the “reversing timer” with the photocell. Also remove the “power timer” entirely & run that (+) lead straight to the relay. For the timer override you want for door closing, the timer just needs to be inline with the photocell output. You’d set the override timer to turn on at 8PM & off after you’re sure the photocell would be off (10pm). Again though the main problem with the photocell method is the power draw — you’d need a dedicated power source or a larger solar panel. Sounds like there’s enough interest in the photocell method, I’ll try to do a writeup about it in the next day or two. Great, thanks Wick! If you do a write up, I’d be interested to see if you can determine a method to delay the photo relay to limit the constant power draw. Thank you so much for taking the time to write this article and explaining it in such detail. I especially like the diagrams. I do not really know the first thing about any of this but following your instructions and tips, I now have a working automatic coop door that I made myself! I did have to reverse the power leads as it turns out I received the older version timers. I’ll be sure to keep up with this blog post as many of your followers have great questions, suggestions and ideas which you have had wonderful feedback on. Thank you again! Hi Christal, glad to hear it worked so well! Thank you for the kind note. The safety switch would be a neat improvement. 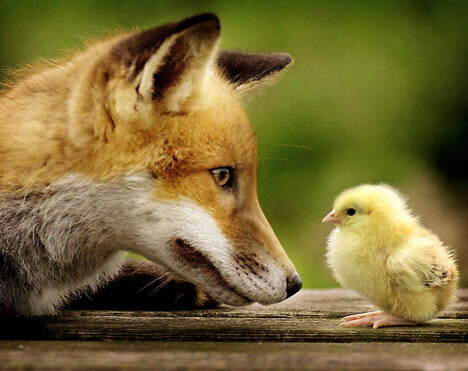 Just concerned the current method may be too late by the time it detects a chicken in the way. I think a mechanical safety might be likely to falsely trip the safety switch when it’s not really necessary & then all the chickens could get eaten by raccoons when the coop door doesn’t shut! I’ve been using this system (but on a swing door) for 7 years so far & only had one chicken get caught in the door, & that was one that tried roosted in the doorway regularly because it was at the low end of the pecking order. Good to hear the door worked out, thanks for the comments! Hi, Wick, have you already got and tested the FRM02 module ? Hi SergeyChick, yes I did & it would work, but not easy. The problem is since this module is not clock-based, you have to trigger it at the specific time you want each event cycle to occur. So for instance if you want the door to open at 6AM & close at 9PM, for setup you’d have to actually be there to trigger the module at both of those times. I’d use Unlimited Cycle Mode A (#16). T1 is the relay switched-on time, & T2 is the delay between cycles. So for instance set T1 to 1 (minute) & set T2 to 1439 (minutes), & set NX to “6060”, which sets the timing base unit for T1 & T2 to 60 seconds. You’d set that same program for both channels, trigger CH1 at 6AM & trigger CH2 at 9PM. Another problem is if the power goes out, you would have to re-trigger both channels again. My preference is still the clock-based timers because you can do all the setup anytime, & I think this FRM-02 module is better used for other applications. But, in theory it can do everything that’s necessary! Dear Wick! Thanks a lot for your support. I was also dissapointed that there was no timer with backup battery to keep the time cycle as need. Have already got timers, relay module and actuator and hope to connect it this weekend. Could I use this set up to power two linear actuators? I have this exact setup on my one coop, but am building a second one right next to it and thought I could just run a second wire to the second actuator instead of building a whole separate system. Thanks so much for this write up. I absolutely love it! Thanks! Sure two actuators on the same timers/module should work fine. It won’t matter if one closes faster than the other because the system relies on each actuator’s cut off switch. Just make sure your power supply provides enough amps to run both actuators. If each actuator is rated for 5 amps, then 10 amps is the theoretical max power draw that your power supply should handle. 10 amps is also the limit of the relay module. That said, as long as your door opens & closes fairly easily, the actuators won’t draw max amps & running both actuators is probably more like 2-4 amps total. Realistically I think either the 7-amp battery or the 6-amp dedicated power supply are plenty to run 2 actuators. But again make sure the coop doors move easily or else the actuators will draw something closer to their max amps rating. You’ll be able to tell if the power supply can’t keep up with the power draw if the actuators run slowly/weakly. If it’s really underpowered, the relay module might start clicking rapidly if it can’t maintain enough power to keep the relay coil energized… Good luck! Next step I want to hook a solar panel to it so I can loose the extension cords. I’d be using it to close the door, as that’s what we’ve had the most issues with in terms of needing to adjust in order to make sure the chickens are in at a safe time. Any help would be appreciated, and thanks again for this resource. Interesting, nice find! The output from that timer is AC power, so I think the easiest way to incorporate it would be to run the timer output to a 2nd DC power adapter, & the DC output from that setup is a direct replacement for the 12VDC “close” timer in this wiring diagram. You could also use that same timer/power adapter setup as a direct replacement for the photocell in this automatic coop door method — with that system you wouldn’t need a 2nd timer to open the door. But personally I prefer using 2 timers because I don’t like how that photocell method powers the relay coil for hours at a time, but in theory the relay is designed to handle that & should work fine. And should I add another fuse for second DC adapter? Hi Eric, I think you have it exactly right. The DC adapter wired to the switch just provides a signal to the relay module — it doesn’t power the actuator motor — so for the switch’s DC adapter I think you’d be better off using a small very low power 12VDC adapter (like 500ma output), & in that case I wouldn’t bother with a fuse. Low-power 12VDC adapters usually plug right into an outlet so you might need to cut the end off a short extension cord or use A/C wire with a DIY plug end to make something you can just plug the 12VDC adapter into. Also make sure you don’t accidentally connect the positive output from the switch’s DC adapter to the other DC adapter’s ground wire. Most adapters have a white wire or a wire with some type of marking (not tiny writing though) printed on it — that’s positive. I’d use a multimeter to be sure, if you have one. Good luck, any other questions fire away. Ok, got the multimeter, found a 12v500ma DC adapter in the garage, wired it all up. Managed not to short anything out, but when I flip the new “close” switch via the Honeywell Lightswitch, I just get a little flicker on the LED2 indicator. LED1 lights up fully when timer 1 performs the “open” function, but it looks like maybe the DC adapter i’m using is underpowered? Weird, the specs I found said max trigger current draw is 65ma (so the supply should be more than that), although the specs were for what looked like the same module but different manufacturer. And under yet another dual relay module that looks the same, Amazon lists “Trigger current is 2-4mA”. I don’t think there’s any danger in using a much larger power supply, although I’d use a fuse with the 6 amps one. The module will draw whatever it needs. Just shouldn’t be necessary. I have a variable power supply with an amp readout & tomorrow I’ll test what that relay module needs to trigger & write back. Do you know if anyone makes a DSPDT relay rated for 110V? Hi Eric, I don’t think there’s a module for it. But the dual-relay module just makes things easy to wire, & instead of the module you could always use individual components (two SPDT relays) like this. I think that would work well because you could still use DC power for the switched contacts & AC power from the solar timer for the relay coil. I ordered the parts to experiment with & will write up another blog post about it assuming it works well. Once again, nice find on the solar timer, I had no idea those existed! I had this idea to use a linear actuator and thought surely someone has done this already. So… after a quick google Search I found you. I followed your easy instructions and I have a working automatic coop door. What I found most helpful was your parts list. I have power to my coop so I used the trickle charger. The actuator I used has a 14” stroke. I previously had a manual operated door with a rope and a pulley so I had to use the longer stroke. It works perfectly and my wife is very happy. A big THANK YOU! Hi Carl, that’s great to hear! Thanks for the note. Love the design but any way you could put a diagram of everything together in one picture.. I’m not good with electrical but can follow the pictures better if it was all hooked up in one. Hi Kendall, you’ll see each of the “power supply” diagrams have a pair of red/black wires that heads off to the right side. The main wiring diagram (with the timers etc) has red/black wires coming in from the left side. Pair any of the power supply diagrams with the main diagram & they connect through those red/black wires, & you’ll have the complete diagram. Hope that helps! I’m having trouble getting 2 of the 16 gauge wires in the relay switch…the hole is too small to get two end wires. How did you do it? Hi Bo, I twisted the wires together tightly & then soldered them, & squeezed the solder with flat pliers into a square shape that fits into the terminal block. If that doesn’t work, keep in mind that power & ground don’t need to be daisy chained in series like I show it in the wiring diagram. They can all be individual leads. Since it’s electricity, it’s all the same in the end. For example for the relay module’s 3 positive power leads & 3 ground leads, they can be six individual wires that run to the positive & negative leads from the power supply. I really like your design and would like to apply it to my 5 stall chicken coop. I’ve currently purchased the items you’ve listed and will be attempting to install your design on one of my chicken coop doors. Currently I have the chicken doors rigged with a pulley and cord system, where I open and closes them daily. If successful with installing your Photocell system on the one door, how difficult would it be to include the other 4 chicken coop doors? Can the other doors be added in series? Or does each door need a separate system. I purchases a 100w solar panel with a 30A charger(Max output 30A). Hi Timothy, adding the other doors so they all run off 1 photocell & 1 relay should work great. I’d get the Magnecraft “heavy duty relay” that I linked to in the photocell blog post, so it can handle powering all the actuators simultaneously. Technically you’ll want to wire the actuators in parallel, not series, so in other words each of the +/- wires from the actuators is run to the same 2 contacts on the relay — all ground wires together, & all positive wires together. Your 30A output is perfect since each actuator motor typically draws between 1-5 amps (depending on how hard it has to work to open/close the door), the max load for 5 actuators is ~25 amps. Make sure you use a fuse on the positive lead from the power supply. Sounds like a 30-amp fuse would be the correct size. I followed your advice and ordered a 12V 30A Magnecraft relay DPDT on Ebay. It should be here in a few days. It looks similar the one in the video, except it’s gray and the pins are pointing upwards, but in the same configuration. I attached drawer sliding brackets to my doors to minimize the drag on opening and closing the doors. I’m thinking this will help reduce the amps pulled by each actuator. 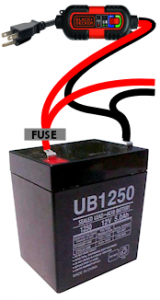 Also, will a 30A car fuse work? Sure a 30-amp car fuse should work fine. I’m not an electrical engineer but with a 30-amp power supply I’d also put a 7-amp fuse on each positive lead to each actuator for safety. You can usually find a 10-pack of 12V fuse holders rated up to 30 amps for ~$10 on Amazon. Also like you said the Magnecraft pins are probably the same, but it should come with a wiring diagram either as a pamphlet or on the relay itself. Good luck! Hi Wick. I have a working door ( works off lamp timer). I’m using an Add-a-Motor that switches direction automatically. Do you know a way to set it up on a photocell control. Open at sunrise close at dark. Would the plan you show using just a relay work? I’m a plumber not an electrician. That photocell & relay in my instructions is 12VDC & sounds like your system runs off of 120VAC, so those parts I specified wouldn’t work. However you could get a 120VAC photocell that replaces your lamp timer, & in that case no relay is needed to switch polarity since your add-a-motor does that. Keep in mind the photocell turns on from dusk to dawn – hopefully that’s what your lamp timer does too. Better yet, get a solar time table programmable timer. It’s a little more expensive than a photocell but more reliable. Hi Wick, and thank you for your design. I’ve set this up, but have yet to get it operational after checking my wiring against your diagram over and over. 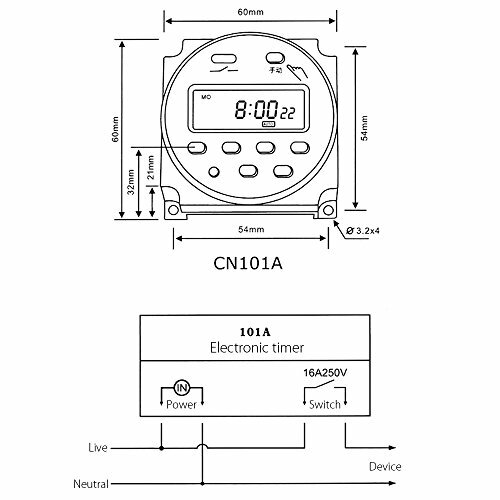 You note in your post that “Sometime in 2016, these CN101A digital timers changes so the two power leads are reversed….” and describe how you revised your post to reflect the (-) is connected on the far left and (+) second from left. Looking at the back of my timers, however, the (+) is on the far left followed by the (-). Do I have “old stock” timers, and if so, how should I revise my wiring? I presume I should simply reverse the first and second wires, but am curious what you think before I make changes. Hi Wick. I’ve wired/assembled the components you list, to know avail. Then I paid closer attention to the “Note” in your plans: “Sometime in 2016, these CN101A digital timers changed so the two power leads are reversed from how earlier CN101A timers work. I’ve updated the wiring diagram above to reflect this change, so now looking at the timers from the front, (-) is connected at the far left & (+) is 2nd in from the left.” I’m wondering if my timers are “new old stock”, since (considering the markings on the back of the timer, but reading from the front) the (+) connection is on the far left and (-) is second from the left on my timers. I presume I should invert the two left-side (power) connections to accommodate this difference – do you agree? The “switched output” wiring on the far right of each timer stays the same. I assume that the problem is the timers weren’t triggering (no red light). If something else is happening, let me know more details & I can try to help troubleshoot. Hi Wick. I switched those two power wires and away it went. Thanks for letting me bounce that off you. I looked at some pictures of the CN101A timers being sold on Amazon, and notice some other manufacturers have the (+) is on the far left followed by the (-) on the second from left position. Apparently there’s no “universal” configuration for those connections. My battery won’t stay charged. I bought a small battery, and about a month into it. It would not hold a charge so I thought it was a dud. I then bought a bigger lawn battery, and now it won’t hold the charge either. I don’t know why but I have everything hooked up the way you did. I don’t think the sollar panel is charging the battery, and it is causing the battery to go dead with no power. How can I fix this? or know exactly what the problem is. It opened and closed fine, but now the battery shows no power on the solar panel charger, but the solar panel shows its hooked up and light bulb is showing on solar panel charger. I have the exact same issue!!! Let me know what you find out! Whoops! Sorry Kendall, I missed your comment until now. 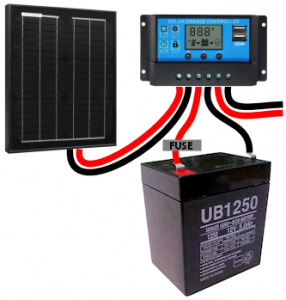 Hmm… when the solar panel is charging the battery in full sun, what does the solar charge controller read for voltage? What size solar panel did you get, the 10W panel? And the timers only stay on (red light) for a few minutes each day? The three possibilities I can think of are a bad solar panel, bad solar charger, or a constant power drain. After what you wrote about the battery, I think it’s safe to assume the battery isn’t the problem (but good first step to troubleshoot!). Wick you are the man of the year. Did exactly what you speced and it works like a champ!!! I am so so grateful there are Wicks in this world. If you add a donate button with Paypal, I would gladly toss into it to keep you going. I am sure others would too. Hi Patrick, thanks for the kind comments & taking the time to write. Happy to hear it! I have fun just trying to figure these things out & putting together instructions to hopefully help others — but I’ll set up a donate button to a charity though! It’s one month shy of two years with your design. I can’t thank you enough for the help and peace of mind you have given me and my girls. I bought one each spare parts thinking I may need them but (knock on wood) I haven’t yet. Again, thank you for sharing your knowledge. Hi James, that’s great. Thanks for writing! Thanks for your thorough instructions on building this automated chicken door. I have everything wired and all works as advertised. Now I need to figure out the best mounting position for the actuator for a horizontal door. Any advice and pictures will be appreciated. I will be trying to build the auto coop door and have never done anything like this-ever! It’s going to be a huge stretch for me but I am hoping I can figure it out with all your information and posts. I have a Goal Zero Maintainer 10 Solar Charger https://www.goalzero.com/shop/trickle-charger-inverter/maintainer-10-trickle-charger/ that I plan to use. I want to make sure I have all the other parts ordered but it seems there’s been many changes/updates. Will you let me know what other parts I need? Thanks!!! Hey Mike, no problem at all — did you watch the two troubleshooting videos near the end of the blog post? One video is a wiring walkthrough & the other video shows how to troubleshoot the relay module. If the relay module works when you apply power directly to the IN1/IN2 wires as shown in that 2nd video, it’s probably defective timers. The other possibility is your power supply isn’t putting out enough amps but if you used the parts I described (or equivalent) it should be fine. Those timers are cheaply made — defective timers has been the most common problem people on here have reported back. Even if that red light on the timer lights up, unfortunately that doesn’t guarantee the timer is actually working. I’ve never done anything like this before and thanks to you : I did this myself and IT WORKS! 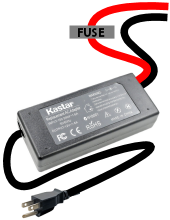 Is there a reason to use the DC adapters vs just using AC timers/actuator/relay to begin with ? Hi Chrissy, that’s great to hear! I think the main reason to use DC power is probably that DC is safer to work with for anyone who isn’t familiar with wiring projects. Also the outdoor-rated DC linear actuators are very inexpensive. But other than the linear actuators, the other components like timers & relays are all available for AC too & cost about the same. 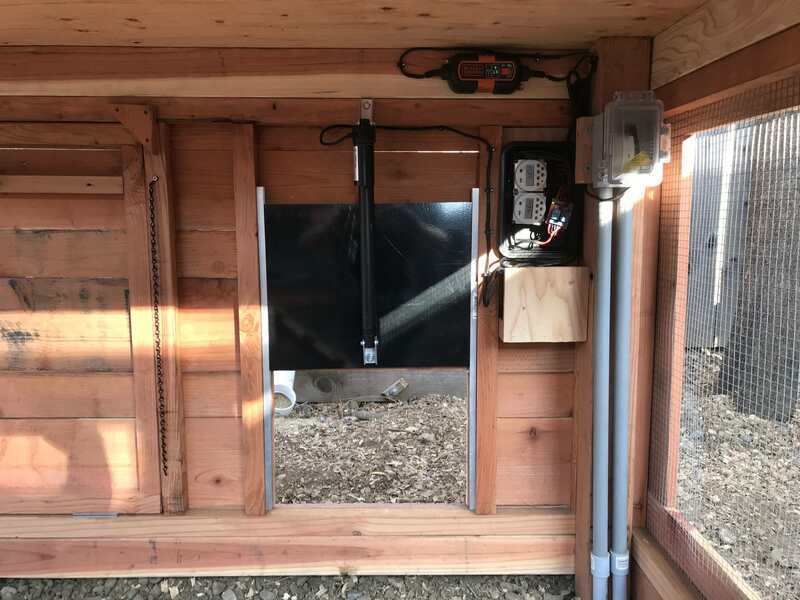 A few days ago I posted another automatic chicken coop door method that uses AC power with a solar time table switch that automatically adjusts the switch time throughout the year based on available daylight. The solar time table switch runs on AC power & so the relay (coil) does too, but it also still uses a 12V power adapter for the linear actuator. Hey Wick, just an update…I checked the output on the timers and both worked just fine. I then checked the relay per your instructions and it failed. I ordered a new relay and the door has worked like a champ for a whole week…really enjoying sleeping in. Thank you again for your design, your instructions, and most of all your willingness to work with us all to make sure our projects work!! Hi Michael, hopefully if those relays are going to fail, it’s defective from the start. I haven’t had trouble with mine in the years I’ve been running it, but let me know if you run into any problems later on. Thanks for the note! Perhaps you can point me in the right direction. 12/12/2017 I wired this up and it worked like a champ. And it continued to work until about this past December, when suddenly it stopped. I currently have the automatic door set up with a manual DPDT switch. So I need to let the chickens out in the morning and close up at night. The unit just stopped working. No loose wires. The timers work, the relay board appears to work, but I get no output voltage at the board end. The green light on the board is on, the relay LEDs light up, but nothing. I replaced the timers and the board and still nothing and I am mystified. I hear the switches in the timers actuate but I do not hear the board relays click. How can I test just the board? I am fairly electronics astute but have real trouble reading a schematic. Any ideas other than Tennerite? Thanks. To test the relay board, try skipping the timers & put a positive (+) lead straight to the input terminals on the relay board (labeled IN1 & IN2). Then if you don’t get any voltage at the relay board outputs, I’d guess then it’s either another bad relay board, or a problem with the power supply. See this video for more help. Make sure the jumper on your new relay board is set to trigger on high voltage (not low)… the red lights on the relay board should stay off until the timer triggers it (or you touch power to the IN1/IN2 terminals). Good luck, let me know if it’s still not working. I think it’d be interesting for people who have coops close to their house to be able to use door sensors like from Ring/ADT and have alerts sent to them if a door is still open from malfunction. Also would be really cool if you could hook into Alexa and have her close the door for you. Any idea what gauge wire I would need if I need to run 15ft from my timer/relays to my actuator? I have romex. My coop sits on a concrete platform under a roof and it’s a ways away from where I’d need to place the solar panel and electronics. Hello Wick You are the Master!!! Guys ,I did exactly what Wick recommended to the letter. I made screenshots of connections, expanded them and printed them in color. My system uses a vertical guillotine like door, and has been working in Chicago area winters for a year flawlessly. Wick please add a Paypal donate button to this page and I will feed it. So will others. Now that my system is working flawlessly, I would like to use test points WHILE IT IS WORKING which tell me the timers and board etc is working. Could you kluge up a test procedure that you would use on it while it is working which would isolate exactly whatever problems may occur when it is not working? I would imagine from reading the above thread that it can crap out at any time, then you are scrambling to try to remember stuff and figure out what is wrong. Has anyone ever had a problem with the door opening but not closing? I thought I had a bad relay module but I bought a second relay and it is still occurring. With both, the LED 2 light comes on and will not go off. After working on this some more, I rewired the connections and it now works. It would be nice to know why this fixed the problem but I will be content that it does work.